In december 2017, I had the pleasure to attempt a short journey through the Alentejo region of Portugal. The intention was of course to get to know about the fabulous olive oil being produced but there were a few culinary things that caught my attention too. Besides the whole experience of rustic interiors, honest people and good wine, there was chef Leopoldo Garcia Calhau from Café GARRETT in Lisbon who left a strong impression on me. The first evening we were invited to enjoy a delicious dinner in his restaurant and it didn’t take long to find out that the man in the kitchen knew what he was doing. His dishes were not complicating things, they were made of three, maybe four ingredients but in a really distinctive way. Later that evening I was allowed in his kitchen and had the chance to ask my questions, as I ate a few things I did not experience before. His dishes were packed with history and simplicity but in an awesome way. He told me about the heritage of Portuguese cooking, the fresh and local ingredients and that it was a poor man’s way of cooking. He takes t(his) background and puts it into contemporary cooking…simply delicious and memorable to me. By him, the migas dish was something I wanted to cook for myself ever since. Finally done, I am not to certain about my recipe being an original yet this is what makes cooking such a great thing. Take a recipe from here, a picture from there and mix it with your memories and emotions…et voila, a plate full of happiness. My migas recipe is plant based and free of sugar, so it gives one a good feeling too while having the second plate. I enjoyed the local and simple appearance of this dish so much, that you might find a second one from Mr. Calhau soon on the blog. As migas for example is traditionally made of old bread, remember that there is no need to waste „old food“, be creative and make something good out of it. We can learn a lot from our grand parents in this matter, so dust off the old cookbooks and get cooking. For the migas, cut the bread into cubes and roast it in the oven at 190°C. Cut the shallot and garlic into fine cubes, then sauté in the olive oil and add the bread. Now reduce the heat and slowly add the broth. Finally, season with lemon, chopped coriander and the spices as you like. For the pickled plums, wash the plums, core them, cut them into wild corners and place them in a jar. Bring the remaining ingredients to a boil and simmer briefly. Then put the stock over the plums and put the jar in a cold place. Cut four 1.5cm thick slices from the broccoli. Peel off the margins with a peeler so that „Broccoli Couscous“ is produced and leave that in the fridge until serving. Now roast the broccoli sharply from both sides in a little vegetable oil and season with salt. To serve, portion the migas in cookie cutters on the plate, next to each give a broccoli and arrange some plums on top. 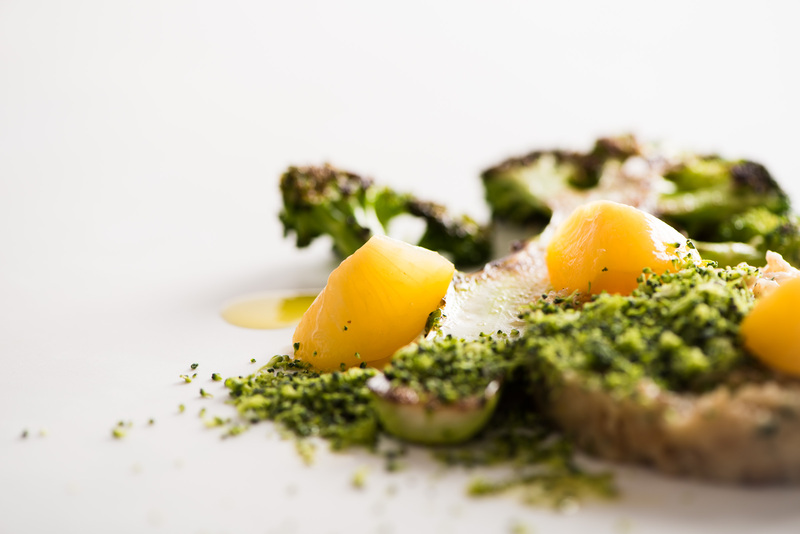 To decorate, sprinkle some broccoli couscous over the migas and nap with a little olive oil. Für den Migas, das Brot in grobe Würfel schneiden und im Ofen bei 190°C rösten. Die Schalotte und den Knoblauch in feine Würfel schneiden, dann in dem Olivenöl anschwitzen und das Brot zugeben. Nun die Hitze reduzieren und langsam die Brühe dazugeben. Zum Schluß mit Zitrone, grob gehacktem Koriander und den Gewürzen nach Belieben abschmecken. Für die Essigpflaumen, die Pflaumen waschen, entkernen, in wilde Ecken schneiden und in ein Weckglas geben. Die restlichen Zutaten aufkochen und kurz köcheln lassen. Anschließend den Fond über die Pflaumen geben und kaltstellen. Aus dem Broccoli vier 1,5cm dicke Scheiben schneiden. Die Randstücke mit einem Sparschäler abschälen, sodass „Broccoli Couscous“ entsteht und diesen bis zum Servieren kaltstellen. 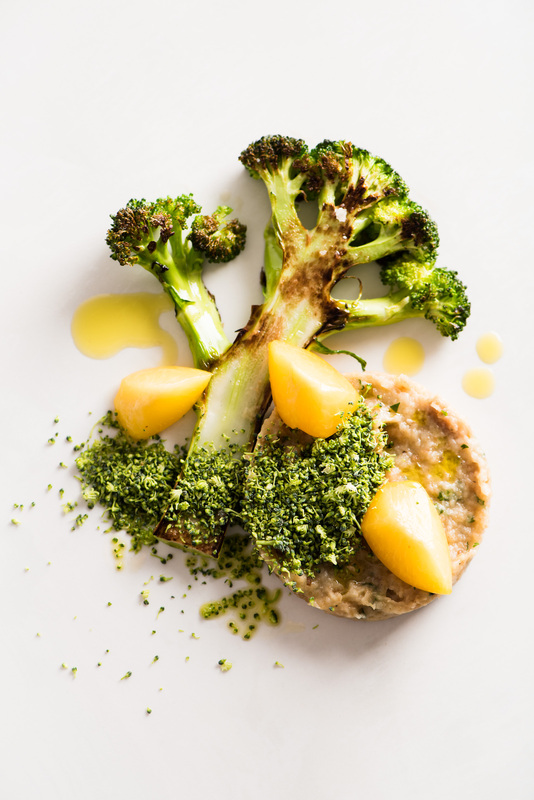 Nun den Broccoli scharf von beiden Seiten in etwas Pflanzenöl anbraten und mit Salz würzen. Zum Servieren, den Migas in Ausstechern auf dem Teller portionieren, daneben je ein Broccoli geben und einige Pflaumen anrichten. Zum dekorieren etwas Broccoli Couscous über den Migas geben und mit etwas Olivenöl nappieren.